Romsdalen in Western Norway is an almost vertical[clarification needed] valley. Vale: A valley through which a river runs. Dell: A small, secluded and often wooded valley. Glen: A long valley bounded by gently sloped concave sides. Strath: A wide, flat valley through which a river runs. Mountain cove: A small valley, closed at one or both ends, in the central or southern Appalachian Mountains which sometimes results from the erosion of a geologic window. Hollow: A term used sometimes for a small valley surrounded by mountains or ridges. cwm (also spelled combe or coombe): A deep, narrow valley. A steephead valley is a deep, narrow, flat bottomed valley with an abrupt ending. Erosional valley: A valley formed by erosion. Structural valley: A valley formed by geologic events such as drop faults or the rise of highlands. Dry valley: A valley not created by sustained surface water flow. Longitudinal valley: An elongated valley found between two almost parallel mountain chains. Similar geological structures, such as canyons, ravines, gorges, gullies, chines and kloofs, are not usually referred to as valleys. 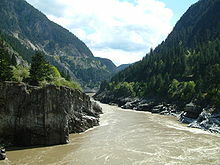 For a comprehensive list of river valleys, see Category:River valleys. A valley formed by flowing water, called fluvial valley or river valley, is usually V-shaped. The exact shape will depend on the characteristics of the stream flowing through it. Rivers with steep gradients, as in mountain ranges, produce steep walls and a bottom. Shallower slopes may produce broader and gentler valleys. However, in the lowest stretch of a river, where it approaches its base level, it begins to deposit sediment and the valley bottom becomes a floodplain. Some of the first human complex societies originated in river valleys, such as that of the Nile, Tigris-Euphrates, Indus, Ganges, Yangtze, Yellow River, Mississippi, and arguably Amazon. In prehistory, the rivers were used as a source of fresh water and food (fish and game), as well as a place to wash and a sewer. The proximity of water moderated temperature extremes and provided a source for irrigation, stimulating the development of agriculture. Most of the first civilizations developed from these river valley communities. In geography, a vale is a wide river valley, usually with a particularly wide flood plain or flat valley bottom. In Southern England, vales commonly occur between the escarpment slopes of pairs of chalk formations, where the chalk dome has been eroded, exposing less resistant underlying rock, usually claystone. Rift valleys, such as the Albertine Rift and Gregory Rift are formed by the expansion of the Earth's crust due to tectonic activity beneath the Earth's surface. 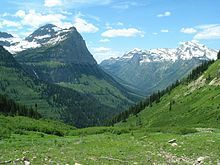 There are various forms of valley associated with glaciation that may be referred to as glacial valleys. A valley carved by glaciers is normally U-shaped and resembles a trough. This trough valley becomes visible upon the recession of the glacier that forms it. 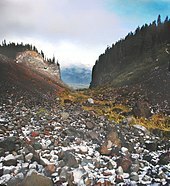 When the ice recedes or thaws, the valley remains, often littered with small boulders that were transported within the ice. Floor gradient does not affect the valley's shape, it is the glacier's size that does. Continuously flowing glaciers – especially in the ice age – and large-sized glaciers carve wide, deep incised valleys, sometimes with valley steps that reflect differing erosion rates. A tunnel valley can be up to 100 km (62 mi), 4 km (2.5 mi) wide, and 400 m (1,300 ft) deep (its depth may vary along its length). Tunnel valleys were formed by subglacial erosion by water. They served as subglacial drainage pathways carrying large volumes of melt water. Their cross-sections exhibit steep-sided flanks similar to fjord walls, and their flat bottoms are typical of subglacial glacial erosion. In northern Central Europe, the Scandinavian ice sheet during the various ice ages advanced slightly uphill against the lie of the land. As a result, its meltwaters flowed parallel to the ice margin to reach the North Sea basin, forming huge, flat valleys known as Urstromtäler. Unlike the other forms of glacial valley, these were formed by glacial meltwaters. In some stress-tectonic regions of the Rockies or the Alps (e.g. Salzburg) the side valleys are parallel to each other, and additionally they are hanging. The brooks flow into the river in form of deep canyons or waterfalls. Usually this fact is the result of a violent erosion of the former valley shoulders, a special genesis found also at arêtes and glacial cirques, at every Scottish glen, or in a northern fjord. A hanging valley is a tributary valley that is higher than the main valley. 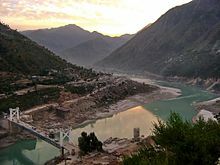 They are most commonly associated with U-shaped valleys when a tributary glacier flows into a glacier of larger volume. The main glacier erodes a deep U-shaped valley with nearly vertical sides while the tributary glacier, with a smaller volume of ice, makes a shallower U-shaped valley. Since the surfaces of the glaciers were originally at the same elevation, the shallower valley appears to be 'hanging' above the main valley. Often, waterfalls form at or near the outlet of the upper valley. Hanging valleys also occur in fjord systems under water. The branches of Sognefjord are for instance much shallower than the main fjord. The mouth of Fjærlandsfjord is about 400 meters deep while the main fjord is 1200 meters nearby. The mouth of Ikjefjord is only 50 meters deep while the main fjord is around 1300 meters at the same point. Glaciated terrain is not the only site of hanging streams and valleys. Hanging valleys are also simply the product of varying rates of erosion of the main valley and the tributary valleys. The varying rates of erosion are associated with the composition of the adjacent rocks in the different valley locations. The tributary valleys are eroded and deepened by glaciers or erosion at a slower rate than that of the main valley floor, thus the difference in the two valleys' depth increases over time. The tributary valley composed of more resistant rock then hangs over the main valley. Trough-shaped valleys also form in regions of heavy denudation. By contrast, with glacial U-shaped valleys, there is less downward and sideways erosion. The severe slope denudation results in gently sloping valley sides and their transition to the actual valley bottom is unclear. Trough-shaped valleys occur mainly in periglacial regions and in tropical regions of variable wetness. Both climates are dominated by heavy denudation. Box valleys have wide, relatively level floors and steep sides. They are common in periglacial areas and occur in mid-latitudes, but also occur in tropical and arid regions. Usually the bottom of a main valley is broad – independent of the U or V shape. It typically ranges from about one to ten kilometers in width and is commonly filled with mountain sediments. The shape of the floor can be rather horizontal, similar to a flat cylinder, or terraced. Side valleys are rather V than U-shaped; near the mouth waterfalls are possible if it is a hanging valley. The location of the villages depends on the across-valley profile, on climate and local traditions, and on the danger of avalanches or landslides. Predominant are places on terraces or alluvial fans if they exist. A hollow is a small valley or dry stream bed. This term is commonly used in New England, Appalachia, and the Ozarks of Arkansas and Missouri to describe such geographic features. In rural areas in America, it may be pronounced as "holler". Appalacian story tellers say that a holler is an area where a person has to holler (yell) to communicate with their nearest neighbor, meaning how deep in the country a person is. List of geological features on Titan, (escarpments and rupes). ^ "Early History, Santa Clara County". National Park Service. National Park Service. Retrieved January 16, 2015. 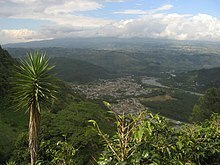 Santa Clara Valley is a structural valley, created by mountain building, as opposed to an erosional valley, or one which has undergone the wearing away of the earth's surface by natural agents. ^ Jørgensen, Flemming; Peter B.E. Sandersen (June 2006). "Buried and open tunnel valleys in Denmark—erosion beneath multiple ice sheets". Quaternary Science Reviews. 25 (11–12): 1339–1363. Bibcode:2006QSRv...25.1339J. doi:10.1016/j.quascirev.2005.11.006. ^ "Illustrated Glossary of Alpine Glacial Landforms - Hanging Valley". .uwsp.edu. Retrieved 2011-10-03. ^ Goudie, Andrew. Encyclopedia of Geomorphology, p. 98. 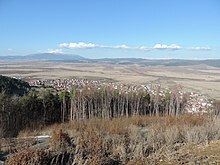 Look up Valley in Wiktionary, the free dictionary. Wikisource has the text of the 1920 Encyclopedia Americana article Valleys.